What is something that you crave for your birthday? Is it a big chocolate cake? Is it ice-cream? Me, I crave homemade fettuccine! Well, not every year. But this year…this year…I was craving fettuccine! And so it happened, right when we were taking out the pasta machine, my mother-in-law Teresa (at the moment, she’s in Italy in her hometown in Calabria)called to wish me a happy birthday and I told her my mom is over and we were making pasta. “La tua mamma sta facendo la passsstaaa? Ma quando mai?”. Something to the effect of, “Since when does your mother make pasta?”. So I explained to her that she was making pasta and I was helping her and that we make pasta together, even if she’s never seen us do it. I can remember making pasta since I can remember eating pasta. I mean, I truly believe that strands of silky smooth fettuccine are literally running through my veins! It’s that much a part of my life. So there is a little bit of cooking rivalry going on. I was aware of some hints of its existence whenever she comes from Italy to visit us or when we’ve brought my mom there to visit them. But this one phone conversation on my birthday, through the thousands of miles of distance and a not so good cell connection, this one conversation revealed something that I think many women feel with food and their in-laws. Or at least with Italian women. A slight competition in the kitchen! How could you all cook something as good as I could for my son (even though this wasn’t really made specifically for him, but for me and my birthday!)? A sort of disbelief, even though Teresa knows it is true and it does make her happy. But there still is that incredulous moment. That really explains why my mom steers clear from the kitchen when she is here visiting, which is why Teresa never saw my mom and I actually make pasta on our own. In Italian, fettuccine means “little ribbons,” and the pasta does resemble a lovely pile of ribbons when you see it on the plate. The pasta has to be thin like this. If you hold it up, it’s sort of transparent and that is just perfection for achieving the most delicate pasta. I recently shared my pappardelle, a little bit of a wider pasta shape. 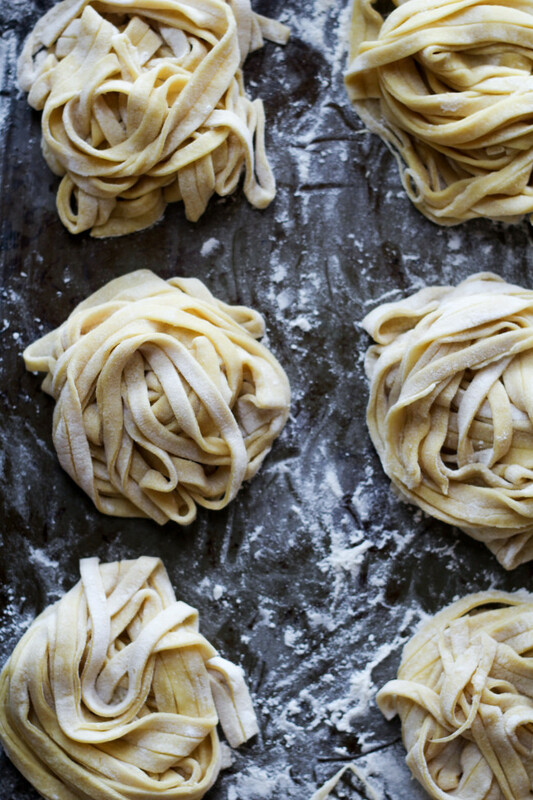 What is the difference between fettuccine and linguine? It’s just a little bit of a size difference. The fettuccine are a tad wider and also a little flatter than linguine. 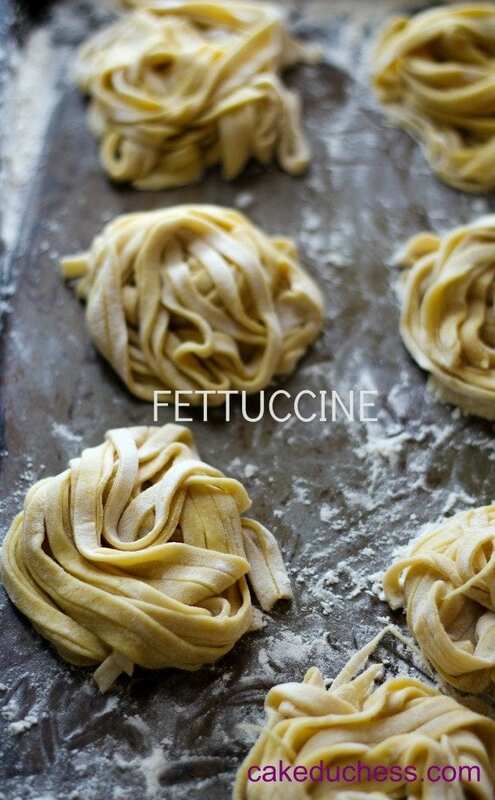 Fettuccine is a great pasta to serve with heavier sauces and especially cream sauces. But on this evening, we did serve them with gorgeous clams. 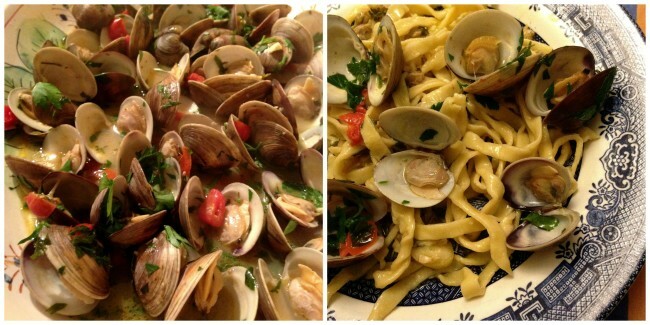 Mom made her famous clam sauce (that’s all I wanted for my birthday!). In a food processor, pulse together flour and salt. Add eggs, yolks and oil and run the machine until the dough holds together. If dough looks dry, add a teaspoon of water. If the dough seems too wet, add a little bit of flour. Cut the dough into 4 pieces, keeping them covered with plastic wrap or a dish towel when not in use. 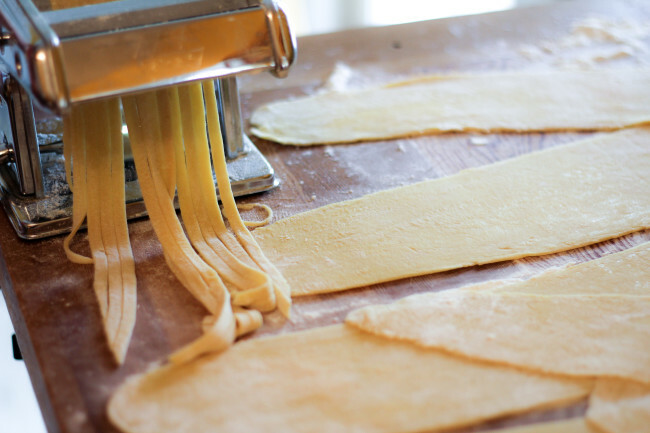 (If you’re rolling the dough out by hand, rather than using a pasta machine, cut it into 2 pieces instead.) Set pasta machine to the widest setting, roll one piece of dough that is flattened into a 3-inch wide rectangle out into a sheet. Fold the sheet in thirds like a letter and pass it through the machine 4 more times on the same setting, making sure to dust lightly with flour if the dough is sticking. Continue to run piece through machine, adjusting to next-narrower setting after every 5 passes, until dough is about 26 inches long. Cut crosswise into 3 equal pieces. Run each piece through machine, adjusting to next-narrower setting, until strip is scant 1/16 inch thick and 14 to 16 inches long. Brush lightly with flour, roll up sheet, and, using a sharp knife, cut into 1/4-inch-wide strips; unroll. 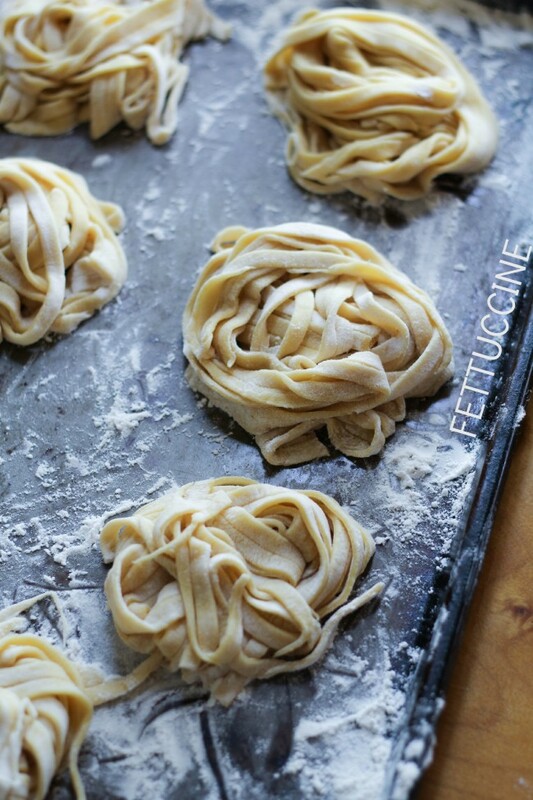 Cut each piece of dough using the fettuccine cutter. Flour the cut pasta so that it does not stick together. 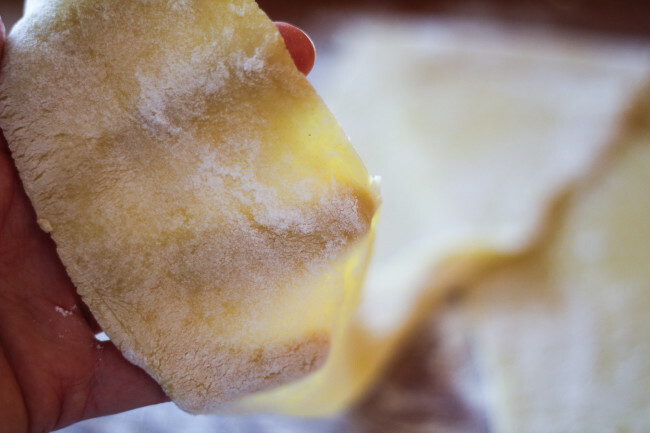 Place cut pasta on a flour-dusted sheet tray and cover with a dish towel while rolling and cutting the remaining dough. It is best to separate the piles of pasta. If you layer them on top, they will stick to each other. Cover with a tea towel while you finish prepping the other strips.Bring a large pot of well-salted water to a boil, add fresh pasta and boil for 3-4 minutes (depending on the thickness, it should be al dente), Drain well and serve with your sauce.